As we sit here typing this week's Tower Site of the Week in upstate New York, it's minus 2 degrees outside with wind chills of something like -21 and way too much snow on the ground...so why not recap one of the hottest tower-hunting trips in this page's history? 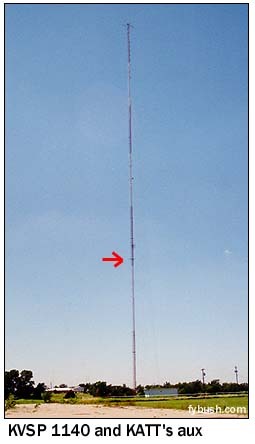 Back in August 2002, the Worldwide TV FM DX Association (WTFDA) held its annual convention in Oklahoma City, and if you've never visited Oklahoma City, well, let's just say you probably don't really want to be doing it in early August. But the company was good and the activities were excellent, and your intrepid photographer found just enough spare time to get out in the 101-degree weather and see pretty much all of the towers that Oklahoma's capital city has to offer. In the absence of any natural boundaries like rivers or mountains, Oklahoma City and its suburbs sprawl for miles across the flat land of central Oklahoma. The city's TV and FM facilities are relatively concentrated on the north side of Oklahoma City - and we'll get there in two weeks - but the AM stations are spaced rather more widely, largely on the south side of the market. 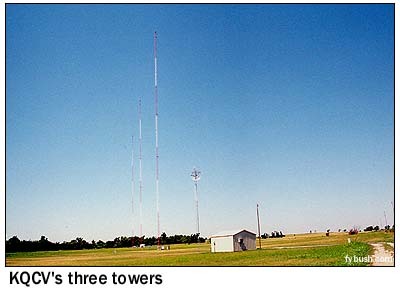 Our tower hunting began at the closest AM to the convention hotel in suburban Yukon, Oklahoma - the three towers of KQCV (800) set back off Council Road near Wheatland, some 12 miles southwest of downtown OKC. KQCV does religion for Bott Broadcasting, and it's co-owned with KQCV-FM (95.1 Shawnee OK) way out to the east of town, which was apparently on low power the weekend I visited. 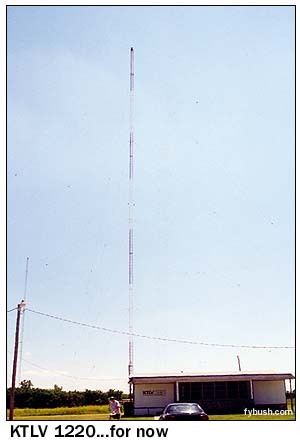 KQCV's AM facility runs 2500 watts day, 1000 watts night from this site. About two miles to the east and just north of I-240 sit the two towers of religious KTLV (1220 Midwest City). That's the ever-itinerant George Greene at the bottom of the frame, walking out of KTLV's studios after inquiring about bumper stickers and other promotional goodies. (If memory serves, he ended up with some maps.) When I took this picture, it was already clear that KTLV's existence on 1220 might be endangered, thanks to a big station move just down the dial and only a few miles away. 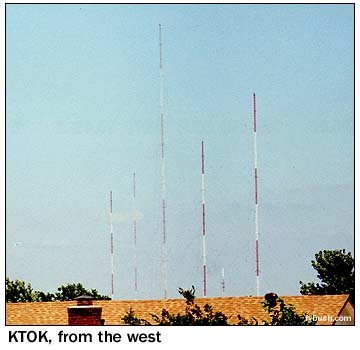 Head south from KTLV to SE 104th Street (also known as NE 27th Street where it crosses the line between the Oklahoma City and Moore street grids) and it's hard to miss the five towers of KTOK (1000), including that 412-footer in the middle of the array. All that steel is used for just 5000 watts day and night, believe it or not, but KTOK gets out awfully well, thanks in part to the amazingly good ground conductivity in this part of the country. So what about that "big move" I referred to? 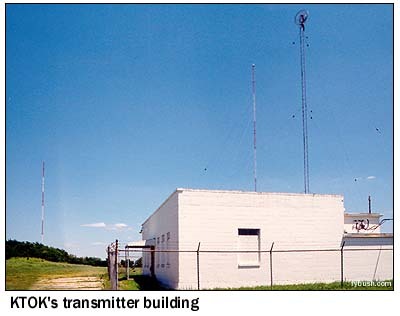 Not long before this visit, Clear Channel - which owns KTOK and operates it as a news-talker - applied to move its KGYN (1210) from Guymon, Oklahoma, way out in the panhandle, to Oklahoma City, where it would run 50 kW by day and 10 kW by night from this very site, adding four more towers for the purpose. 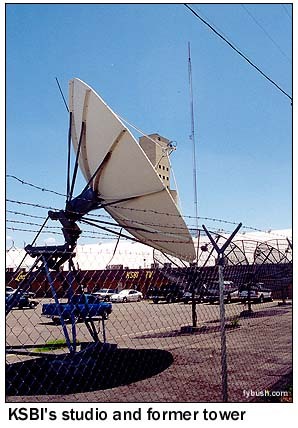 The move of KGYN to Oklahoma City would take KTLV off the air; its "first local service" to Midwest City (which is saturated by dozens of OKC signals in real life) would be taken over by Clear Channel's KEBC (1340) changing its city of license from Oklahoma City to Midwest City. (KEBC would end up being sold to KTLV's owners under this plan, too, with KTLV's programming also moving to 1340.) At the moment, the KGYN application remains pending, nearly four years after it was filed. Tower Site Calendar 2004 is NOW SHIPPING! All orders placed by Thursday, January 15 have now been shipped - and if you haven't yet ordered, what are you waiting for? Click here for ordering information!